I am always pleased, and a bit surprised, when I hear a colleague reminisce of having their first formal oral presentation at a regional AFMR meeting. It is a reminder of how, for more than seventy years, the AFMR has influenced the lives of so many medical researchers. There are several current deans, department chairs, program directors, and researchers whose careers have been shaped by their participation in the AFMR. However, there is a general perception that societies such as the AFMR no longer have relevance to the physician-scientist. I believe this opinion to mostly be a byproduct of the growth of subspecialty societies over the last several years. 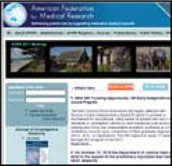 But the AFMR does several things very well and continues to provide a unique value to physician-scientists. It is one of the few remaining multi-disciplinary organizations representing investigators in all areas of biomedical and patient-oriented research. Scholarship, Advocacy, Career Development, Leadership – these are the core missions of the AFMR. What does this mean for you? The Eastern Region of the AFMR showcased its high caliber science and research when it convened at the Washington Marriott Wardman Park in Washington, DC April 5-6 for its 2010 Annual Meeting. This year's program featured excellent abstract presentations across numerous disciplines by authors from many different institutions on the coast and provided great insight from invited lecturers including Charles W. Flexner, MD, of the Institute of Clinical and Translational Research at Johns Hopkins University, who provided the 1st Former AFMR/AFCR President’s Address, and Karen Goraleski of Research!America who gave a fascinating interactive workshop on medical research advocacy. FASEB provided comments to the Department of Health and Human Services on proposed changes to the HIPAA Privacy Rule. The AFMR identified priorities for future investment in biomedical research that were forwarded to the White House Office of Science and Technology Policy by FASEB. The Journal of Investigative Medicine publishes work of broad interest to academic physicians and research scientists in areas pertaining to clinical and biomedical research. Volume 58, number 7 contained a collection of manuscripts detailing the work presented in the AFMR-sponsored Symposium "Regenerative Medicine in the 21st Century" at the Experimental Biology meeting in Anaheim, California (April 2010). Submit an abstract to your AFMR Regional Meeting. Learn about and influence important public policy issues. Apply for a Research Day Award to be presented at your institution's college or departmental research day. Obtain information regarding career development, research and training opportunities, funding sources, and grant development at AFMR Career Connections. Submit a proposal for a symposium at the 2012 Experimental Biology meeting.